Root Canal. Z Dental Group - Beverly Hills Dentist, Los Angeles Dentist. Root Canal Treatment or Endodontic therapy is a sequence of treatment for the pulp of a tooth which results in the elimination of infection and protection of the decontaminated tooth from future microbial invasion. This set of procedures is commonly referred to as a "root canal." Root canals and their associated pulp chamber are the physical hollows within a tooth that are naturally inhabited by nerve tissue, blood vessels and other cellular entities. Endodontic therapy involves the removal of these structures, the subsequent cleaning, shaping, and decontamination of the hollows with tiny files and irrigating solutions, and the obturation (filling) of the decontaminated canals with an inert filling such as gutta percha and typically a eugenol-based cement. After endodontic surgery the tooth will be "dead," and if an infection is spread at apex, root end surgery is required. Although the procedure is relatively painless when done properly, the root canal remains a stereotypically fearsome dental operation. In the situation that a tooth is considered so threatened (because of decay, cracking, etc.) that future infection is considered likely or inevitable, a pulpectomy, removal of the pulp tissue, is advisable to prevent such infection. Usually, some inflammation and/or infection is already present within or below the tooth. To cure the infection and save the tooth, the dentist drills into the pulp chamber and removes the infected pulp and then drills the nerve out of the root canal(s) with long needle-shaped drills. After this is done, the dentist fills each of the root canals and the chamber with an inert material and seals up the opening. This procedure is known as root canal therapy. 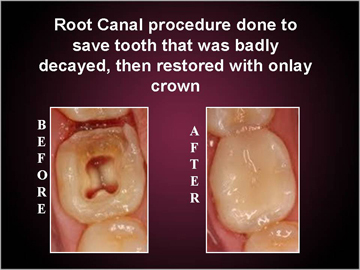 With the removal of nerves and blood supply from the tooth, it is best that the tooth be fitted with a crown which increases the prognosis of the tooth by six times. The standard filling material is gutta-percha, a natural non-elastic latex from the sap of the percha (Palaquium gutta) tree. The standard endodontic technique involves inserting a gutta-percha cone (a "point") into the cleaned-out root canal along with cement and a sealer. Another technique uses melted or heat-softened gutta-percha which is then injected or pressed into the root canal passage(s). However, gutta-percha shrinks as it cools, so thermal techniques can be unreliable; sometimes a combination of techniques is used. Gutta-percha is radiopaque, allowing verification afterwards that the root canal passages have been completely filled in, without voids. For some patients, root canal therapy is one of the most feared dental procedures, perhaps because of a painful abscess that necessitated the root canal procedure. However, at Z Dental Group our dental professionals assert that modern root canal treatment is relatively painless because the pain can be controlled with a local anesthetic during the procedure and pain control medication can be used before and/or after treatment assuming that the dentist takes the time to administer one. However, in some cases it may be very difficult to achieve pain control before performing a root canal. For example, if a patient has an abscessed tooth, with a swollen area or "fluid-filled gum blister" next to the tooth, the pus in the abscess may contain acids that inactivate any anesthetic injected around the tooth. In this case, the dentist may drain the abscess by cutting it to let the pus drain out. Releasing the pus releases pressure built up around the tooth; this pressure causes the pain. The dentist then prescribes a week of antibiotics such as penicillin, which will reduce the infection and pus, making it easier to anesthetize the tooth when the patient returns one week later. The dentist could also open up the tooth and let the pus drain through the tooth, and could leave the tooth open for a few days to help relieve pressure. At this first visit, the Los Angeles dentist must ensure that the patient is not biting into the tooth, which could also trigger pain. Sometimes the dentist performs preliminary treatment of the tooth by removing all of the infected pulp of the tooth and applying a dressing and temporary filling to the tooth. This is called a pulpectomy. The dentist may also remove just the coronal portion of the dental pulp, which contains 90% of the nerve tissue, and leave intact the pulp in the canals. This procedure, called a "pulpotomy", tends to essentially eliminate all the pain. A pulpotomy may be a relatively definitive treatment for infected primary teeth. The pulpectomy and pulpotomy procedures eliminate almost all pain until the follow-up visit for finishing the root canal. But if the pain returns, it means any of three things: the patient is biting into the tooth, there is still a significant amount of sensitive nerve material left in the tooth, or there is still more pus building up inside and around the infected tooth; all of these cause pain.